The Sepik River is one of the largest rivers on the island of New Guinea, south-western Pacific Ocean with a length of more than 900 kilometers. It was originally named as Kaiserin Augusta. The drainage basin of this river covers an area of around 30,000 square miles. It is made up of swamps, tropical rainforests, and mountains.It originates in the Victor Emanuel Range and discharges into the Bismarck Sea at Papua New Guinea’s northern region. The area surrounded by this river is very large reserve grassland. Sepik River is one of two vast tropical rivers in Papua New Guinea. This river is home to some of rarest plant and animal species, including two species of crocodile, one saltwater and one freshwater. It is one of the few rivers that remain uncontaminated by any kind of human interference. Andrew Johnson and Clark Carter travelled the entire length of this river by hiking, kayaking, and canoeing in 2010. It took them six weeks to travel from the source of the river to its mouth. The tributaries of this river are divided into the Left and Right Tributaries. The left tributary is the Yellow River only and right tributaries are Keram River, the April River, Yuat River, and Karawari River. For most of its lower course, the river flows through sago and nipa palm swamp and lagoons. This river is navigable for more than 300 miles by using vessels and around 550 miles by canoe. Declan, Tobin. " Fun Facts about Sepik River ." Easy Science for Kids, Apr 2019. Web. 23 Apr 2019. 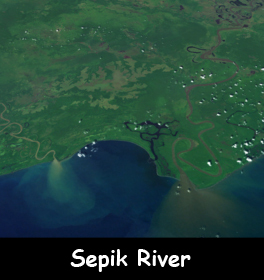 < https://easyscienceforkids.com/sepik-river/ >.